Dr. Payam, I could not agree more. I think you illuminate, quite well, an underpinning of homophobia that isn't always acknowledged: the disinterest in understanding people, cultures, or issues that are different from one's personal experience. I find this problem particularly, well, problematic lately in our national political discourse. We have, on one hand, a vocal "populist" movement that cries out to preserve their self-interests, or way of life (which are under threat by what? I'm not sure exactly). And on the other hand, there's a progressive movement that seeks to enfranchise/empower those who have been left out, politically --immigrants, LGBT's, the working poor. I think the proper object of curiosity for gay, lesbian, queer youth--and adults--is why we are this way: Why did God make us gay? What does it mean to be gay? What is the place of our homosexuality on our spiritual path? What insights might our sexuality give us about the nature of life? These are important questions. Ironically, we are discouraged from asking them both by our "enemies" who deny that homosexuality really exists and think we should just turn straight out of good behavior and by our "supporters" and theorists who declare homosexuality such a regular and routine part of life that it shouldn't matter and/or that it is just a political/cultural construction, and so there are no worthy questions about homosexuality. 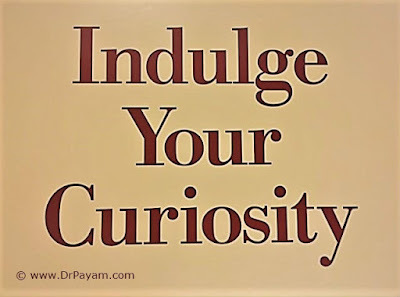 I like Payam's observation that homophobia discourages curiosity. So then the next big question is what is homophobia and how do we relinquish it? This is our hero's journey. Jung's ideas about the Shadow offer insight here: what we dislike in others is what we fear about ourselves. Letting others be OK just as they are allows us to be OK just as we are without resistance.